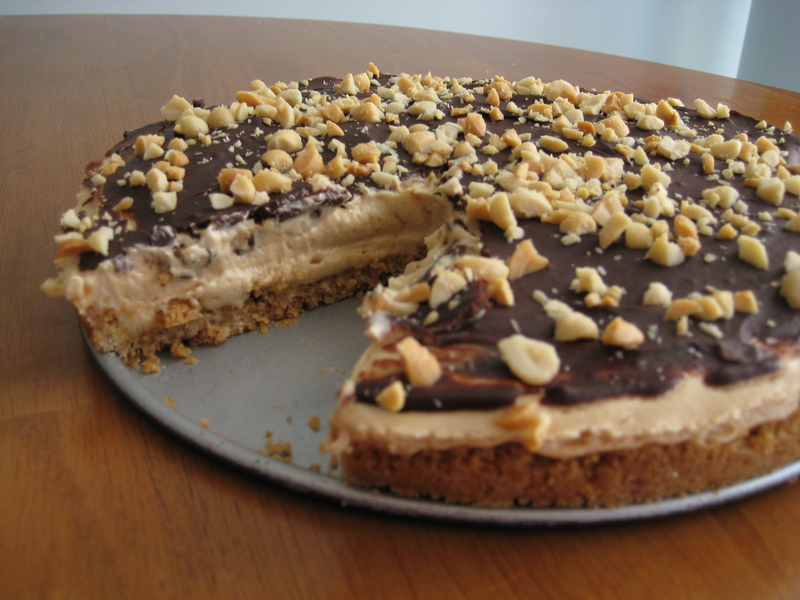 I don’t get to spend as much time as I’d like anymore perusing Serious Eats. Fortunately, they haven’t forgotten about me & still send me their weekly recipe newsletter. 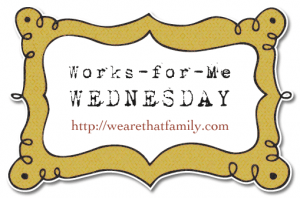 Today’s recipe is an easy version of one from said newsletter. 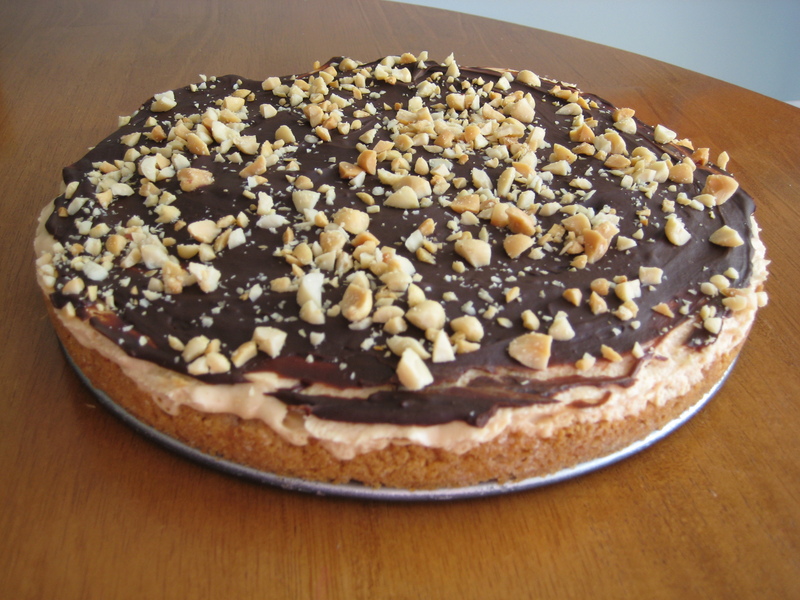 If you feel like scraping vanilla beans & crushing your own graham cracker crumbs, find the recipe here. If you’re pressed for time like me, read on. I think I underestimate how much I love pudding. It’s not something I ordinarily think to buy, but maybe it should be: it was the first thing I ate after my C-section (thank you, breech Mini-Munchkin). I ate it with every subsequent meal in the hospital. Hmmm… Pudding with every meal? I could go for that! In the meantime, here’s pudding with dessert. Prepare the pudding as directed on the package, just with 2 cups milk instead of 3. Chill in the refrigerator. Whip the cream, sugar, & vanilla. Fold about 1/3 of it into prepared pudding. Spread half of the pudding mixture into the bottom of the crust. Carefully spread another 1/3 of the whipped cream over the pudding, then top with almost all of the blueberries. 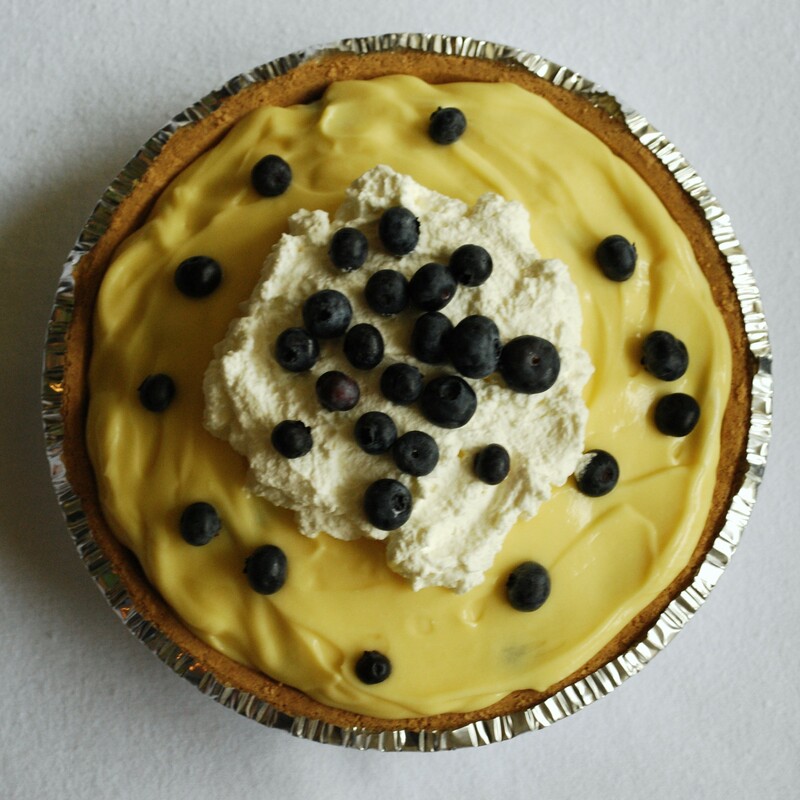 Spread remaining pudding to hide the blueberries, then top with remaining whipped cream & sprinkle remaining blueberries on top. Serve with a spoon; this will get messy! So yes, it’s been a little while since I last posted. My time was occupied with caring for a sick Munchkin, many trips to & phone calls with doctors, not sleeping, & changing about a month’s worth of diapers in less than a week. Oh, & my birthday happened in there somewhere… My Husband The Pyromaniac made a candle bonfire on my birthday pie. Between all that & the fact that it was 85 stinkin’ degrees outside, Thanksgiving kind of snuck up on me this year. Fortunately it was just us & 2 homesick missionaries from our church who’ll eat anything, so I didn’t have to worry about impressing anyone. For starters, I nixed the whole turkey in favor of a turkey breast that weighed roughly what The Munchkin did at birth. (For the record, with just 4 adults & a Munchkin, we still had leftovers.) Thanks to this little miracle I discovered last year, all I needed to do was rub the turkey the night before for the most moist & flavorful turkey (breast) I’ve ever made. Additionally, cooking less bird meant less time in the oven, which meant less chance of the juices scorching. This made for the easiest gravy I’ve ever made: no tweaking or seasoning necessary! I was able to get away without cooking anything until nearly 2pm that day, thanks to My Husband The Pie Man, who baked 2 of his best pies to date — pumpkin & berry — while we watched the Macy’s Thanksgiving Day Parade & The Munchkin sobbed that she wanted to go again this year. We maximized space & oven time in The Tiniest Kitchen Ever by making bread in the breadmaker. Cardinal sin? Maybe. But it was easy & tasted good. For stuffing, we used a closely-guarded family recipe: doctored-up Pepperidge Farm. (Why do you think it’s so closely guarded?) All I did was follow the directions on the package & add a few shakes each dried basil & thyme to the onion & celery. 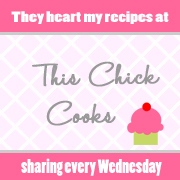 Finally, the one new recipe I did try this year. I made these mashed potatoes. I didn’t bother to read the “don’t use lowfat milk” part of the recipe until the stores were closed & we were ready to start, so I went ahead with the 2% — I rationalized that most people boil their potatoes in water anyway, so any added flavor would be a bonus — & they did just fine. 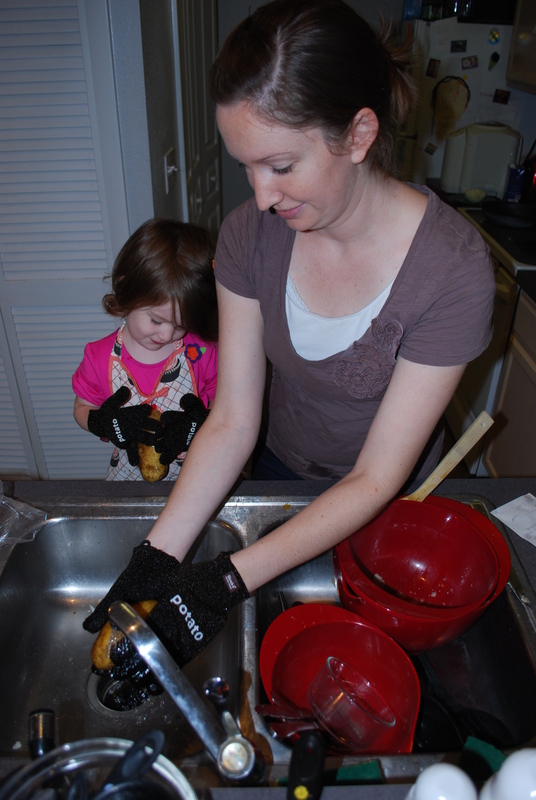 But I think The Munchkin’s favorite part was using one of my birthday presents, matching mommy- & Munchkin-sized potato scrubber gloves, to prep them. The end result? A low-key, delicious Thanksgiving dinner with almost ZERO stress! Best. Holiday. Ever. 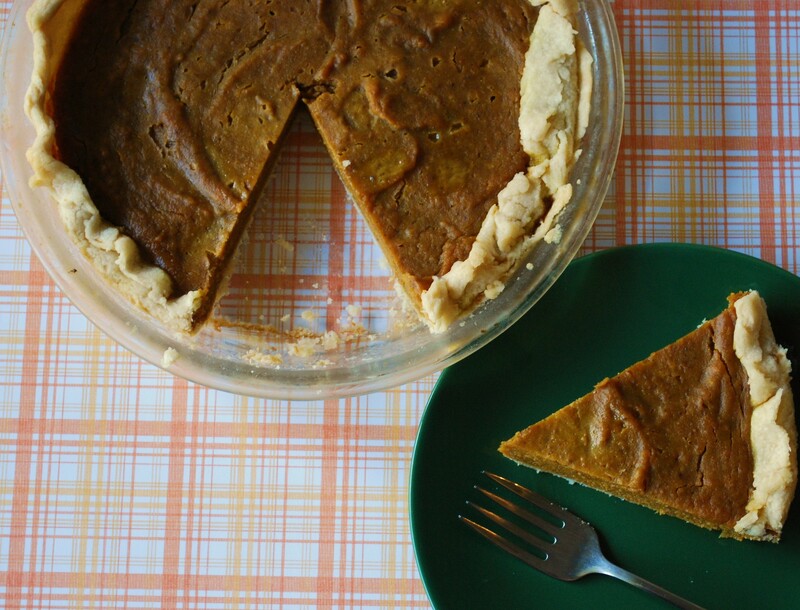 Not Your Grandmother’s Pumpkin Pie. Why? Because it’s my grandmother’s! This is her “Milkless Pumpkin Pie,” but if I called it that you would think it was just some gross substitution for people with milk intolerances. The truth is, because it is milk-free, it’s undiluted — full of spice & flavor. Makes normal pumpkin pie taste bland by comparison. My grandmother got this recipe from a short mid-morning program on channel 5 in Utah years ago that offered tips for housewives. One day the featured guest demonstrated this recipe, saying it was unique because this recipe required no milk. Then they cut to a break; the hostess began to introduce the sponsor, an evaporated milk company, saying how delicious this recipe would be with that company’s milk. 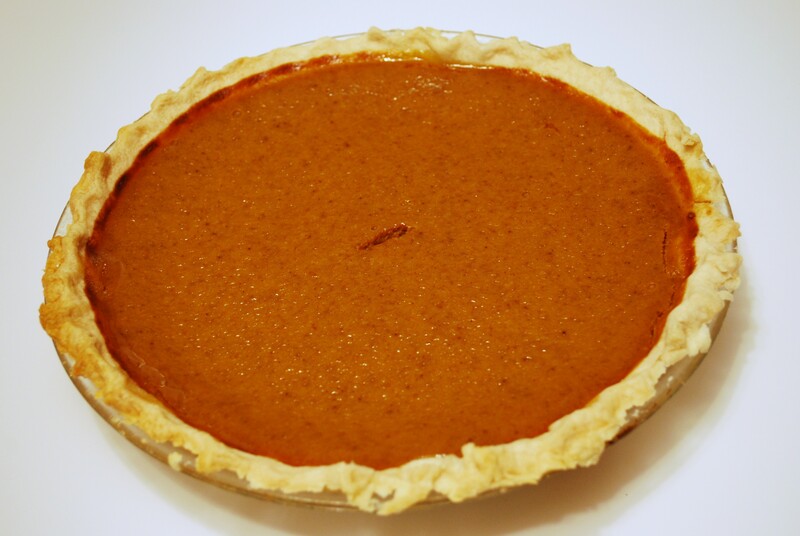 The guest sputtered that it was a milkless pumpkin pie; she talked over him & they went to commercial. I had never made a pie on my own in my life before attempting this one — hence the “interesting”-looking crust. I’ve never needed to because My Husband is The Pie Man. Every Thanksgiving he makes a pumpkin & a boysenberry pie, & they’re always delicious. I’ve included his perfect crust recipe below. 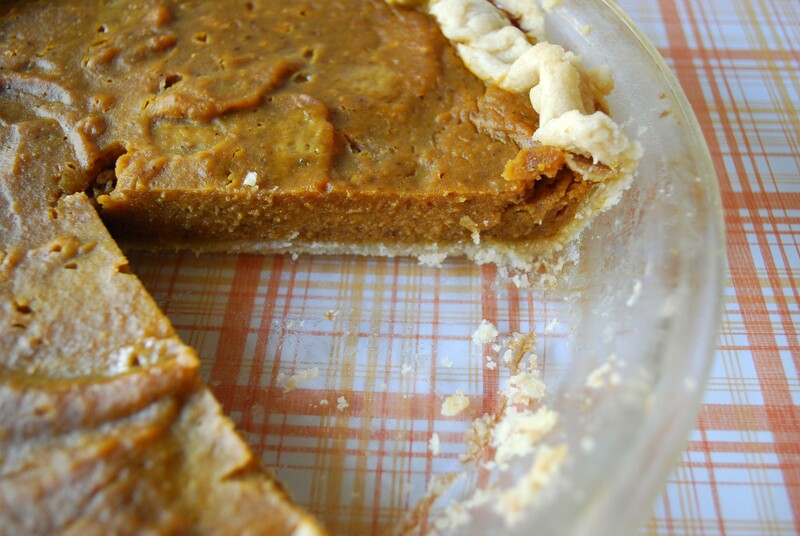 Make My Husband The Pie Man’s Perfect Flaky Crust, below, & lay it in a 9-inch pie plate. Preheat oven to 450. Combine dry ingredients in a small bowl. In a large bowl, whisk the eggs as long as your arm will let you so that they’re light & frothy. Add margarine & pumpkin; mix until well blended. Add the dry ingredients & mix well. Pour into prepared unbaked pie shell. Bake at 450 for 10 minutes, then reduce the oven temp to 350 & continue baking 30-40 minutes, or until a knife inserted in the center comes out clean. Combine flour, salt, & oil in a medium bowl with a fork. The dough should ball up nicely. Add water continue kneading with fork until fully incorporated. Add more flour a tablespoon at a time, if needed, until dough is the right consistency: not too sticky, not too dry. Place dough ball between 2 sheets of wax paper. Roll out until it’s really really thin & larger than the pie plate. 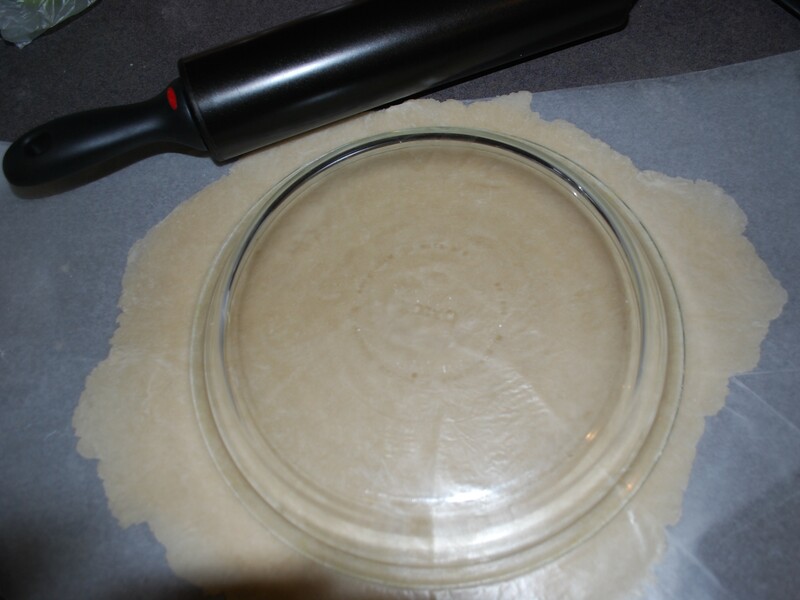 Use a butter knife to gently free the dough from one of the sheets of wax paper. 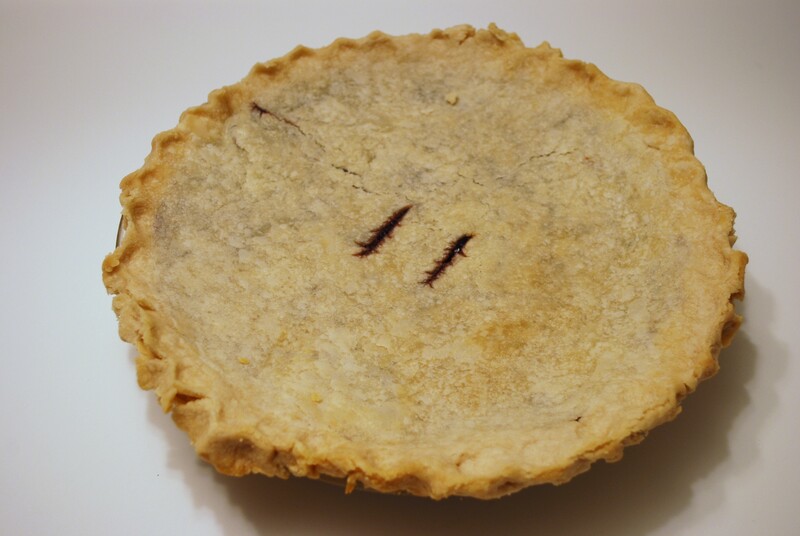 Place it, dough side down, into the pie plate & use the knife again to remove the other sheet. Make it look pretty around the outside. Nope, can’t help you there.